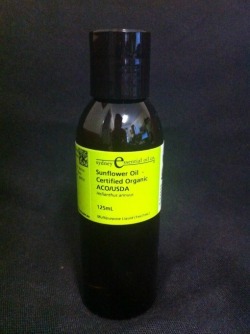 Organic Coldpressed Sunflower Oil. Perfect for massaging baby’s sensitive skin. No preservatives, additives or fragrances contained in this oil. 125mL Organic Sunflower Oil – Nothing more, nothing less. Given the frequency of massage you engage in with your baby, you want to be confident that the oils they are being exposed to is safe for them to ingest (in small amounts). It is inevitable that babies will put their hands and feet into their mouth, thus the importance of using an oil that is organic, additive free and plant derived.